Construction has begun on the new Bauhaus Museum Dessau by Barcelona architecture firm Gonzalez Hinz Zabala, which saw off competition from New York practice Young & Ayata to win the project. Gonzalez Hinz Zabala and Young & Ayata drew for first place in the international competition in 2015, which aimed to attract up-and-coming firms. The winning design features expanses of glazing and an exposed framework. It will host 2,100 square metres of exhibition space for products created by the influential German art and design school. "The Bauhaus in Dessau will receive a very unique and new quality with this museum designed by Gonzales Hinz Zabala, because theirs is an architecture whose design vocabulary follows modernity and whose materiality and flexibility will be functioning very well as an exhibition venue," said the director of the Bauhaus Dessau Foundation, Claudia Perren. The more restrained of the two designs – Young & Ayata's concept comprised a group of colourful pods – Gonzalez Hinz Zabala's proposal was selected in part for keeping within budget constraints of €25 million (£21 million). "I know that many inhabitants wished for the more colourful design by the New York-based architects," said mayor Peter Kuras. "Its cost planning, however, would exceed the defined budget which we are set to keep at any rate." "The two first prize-winners could not have been more different in their architectural concept for the museum," said Perren. "It became clearly apparent during the negotiating phase that the design by the Spanish firm can be implemented within the construction budget of €25 million without impairing architectural quality and functionality." Gonzalez Hinz Zabala has teamed up with Berlin-based museum specialists BAL for the project. Construction began in December 2016 – coinciding with the 90th anniversary of the Bauhaus in Dessau – and is anticipated to complete in time for a 2019 opening. Founded and initially directed by architect Walter Gropius in 1919, the Bauhaus was one of the 20th century's most influential art and design schools. Between 1925 and 1932 the school was based in the German city of Dessau, at a Gropius-designed building that currently serves as a museum. Visitors can spend the night in the former student rooms and dormitories in the Studio Building on the campus. 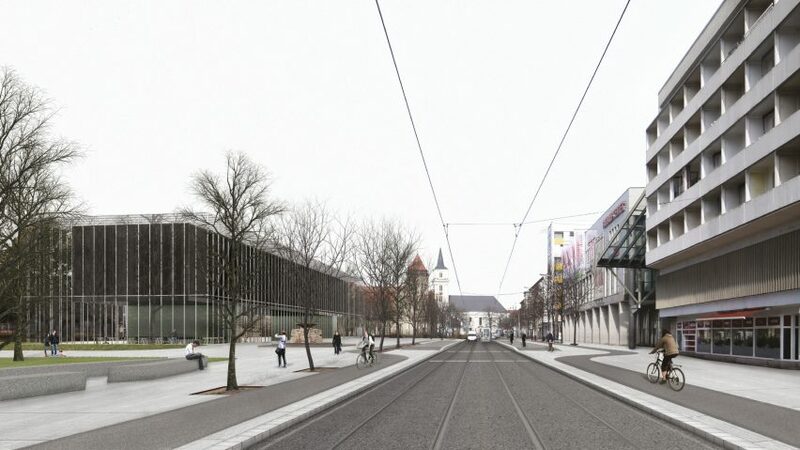 The new museum is planned for a site in the centre of Dessau, located in the city park to the south of the school building.